Venezuela's state oil company said Tuesday that it has stopped selling crude to Exxon Mobil Corp. in response to the U.S. oil company's drive to use the courts to seize billions of dollars in Venezuelan assets. Exxon Mobil is locked in a dispute over the nationalization of its oil ventures in Venezuela that has led President Hugo Chavez to threaten to cut off all Venezuelan oil supplies to the United States. Venezuela is the United States' fourth largest oil supplier. Tuesday's announcement by state-run Petroleos de Venezuela SA, or PDVSA, was limited to Exxon Mobil, which PDVSA accused of "judicial-economic harassment" for its efforts in U.S. and European courts. PDVSA said it "has paralyzed sales of crude to Exxon Mobil" and suspended commercial relations with the Irving, Texas-based company. "The legal actions carried out by the U.S. transnational are unnecessary ... and hostile," PDVSA said in the statement. It said it will honor any existing contracts it has with Exxon Mobil for joint investments abroad, but reserved the right to terminate them if permitted by the terms of the contracts. It was unclear how much oil PDVSA supplies to Exxon Mobil, the world's biggest publicly traded oil company. Both Chavez and Oil Minister Rafael Ramirez previously said the company is no longer welcome to do business in Venezuela. Venezuela's decision leaves up in the air the situation of a refinery in Chalmette, La. 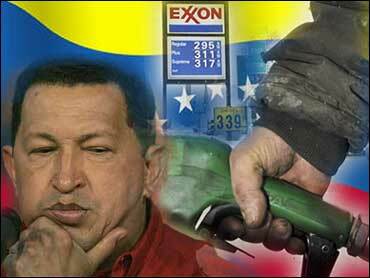 - a joint venture supplied by Venezuelan oil in which PDVSA and Exxon Mobil are equal partners. Exxon Mobil spokeswoman Margaret Ross declined to comment on the move by Venezuela but added that "it is our long-standing practice to take appropriate steps to meet our customers' needs." Exxon Mobil is challenging the Chavez government's nationalization of one of four heavy oil projects in the Orinoco River basin, one of the world's richest oil deposits. A British court issued an injunction last month temporarily freezing up to $12 billion of PDVSA's assets. Exxon Mobil also has secured an "order of attachment" from U.S. District Court in Manhattan on about $300 million in cash held by PDVSA. A hearing to confirm the order is scheduled for Wednesday. Other oil companies including Chevron Corp., France's Total, Britain's BP PLC and Norway's StatoilHydro ASA have negotiated deals with Venezuela to continue as minority partners in the nationalized projects. ConocoPhillips and Exxon Mobil balked at the government's tougher terms and have been in compensation talks with PDVSA. Earlier Tuesday at an energy conference in Houston, Exxon Mobil senior vice president Mark Albers declined comment on any court proceedings with Venezuela, though he said the company is eager to negotiate fair compensation for its assets. Exxon Mobil is taking the dispute to international arbitration, to which Venezuela has agreed. Its legal actions essentially seek to corral Venezuelan assets ahead of any decision by the arbitration panel. Venezuela's announcement came after Ramirez, the oil minister and PDVSA president, reiterated in a newspaper interview Tuesday that Venezuela is ready to cut off oil supplies to the United States if pressed into an "economic war." "If they want this conflict to escalate, it's going to escalate. We have a way to make this conflict escalate," Ramirez was quoted as saying. The White House on Tuesday declined to comment on Venezuela's threat. "When there's a litigation that's ongoing, different parties will say anything to try to win over on an argument," said White House press secretary Dana Perino. Meanwhile, Venezuelan state television has begun airing short anti-Exxon segments, with a message appearing on the screen in red text reading: "Exxon Mobil turns oil into blood." The U.S. remains the No. 1 buyer of Venezuelan oil, and Chavez relies largely on U.S. oil money to stimulate his economy and bankroll social programs that have traditionally boosted his popularity. Some analysts say it would make little sense for Chavez to follow through on his broader threats to cut off oil sales to the U.S. because Venezuela owns refineries in the United States that are customized to handle the South American country's heavy crude. Ramirez said Venezuela is selling the U.S. a daily average of 1.5 million barrels of crude and other products derived from oil.